Christmas may be a long way off but here's some news that will put some ho ho ho in your summer. 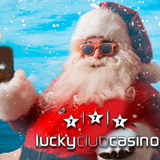 Lucky Club Casino, which offers unique games from Nuworks, has “Christmas in August” bonuses totalling up to $1600 that include up to 250 free spins on their most popular online slot games. Take advantage of all five Christmas in August casino bonuses available this month to get a $50 no deposit bonus at the end of August. Up to $1600 and 250 free spins available during summer bonus event. Coupon codes are valid until August 31, 2015. Details about these and other bonus offers are available at: http://www.luckyclub.eu/promotions.